First, the Imperial player places his initial units (see table to left). Units can be placed in any Imperial systems. A minimum of one (1) ground unit per system (including Coruscant) is required. Then, the Rebel player places his initial units (see table to left). All Units must be located in the Rebel Base space and/or any one (1) Rebel or Neutral system on the map. Choose Factions and take appropriate Units, Leaders, Loyalty Markers, Faction Sheet, Mission Cards and Action Cards. Sort the Objective Cards into 3 stacks: I, II, and III. Shuffle each one separately. Stack the III’s on bottom, then the II’s, and the I’s on top. Set the deck on the board near Rebel Base space. Rebel player takes the top Objective Card into his hand, keeping it secret. Each Player takes the 4 Leaders without a Recruit Icon from their supply and places them in their Leader Pools. 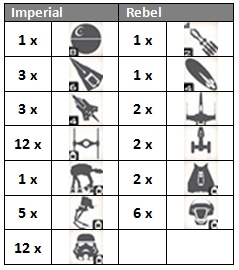 Each Player removes the Action Cards without a Recruit Icon (4 for Imperial, 6 for Rebel) and randomly draws 2 of them, adding them to their hand. The remaining starting Action Cards are returned to the box. Shuffle the remaining Action Cards and set the deck on the appropriate side of their Faction Sheets. Set the Time Marker on the 1 space of the Round Track. Set the Rebel Reputation Marker on 14 space of the Round Track. Shuffle the Space and Ground Tactic decks separately and set both stacks near the board. Set the dice, Damage Markers, Sabotage Markers, and Leader rings near the board. Each player removes the 4 Starting Missions cards (with curved arrow at bottom-middle) and adds them to their hand. Imperial player removes the 10 Project cards (with white star at bottom-right). He shuffles them and sets them on the board. Each player takes their remaining Mission cards, shuffles them, and sets them on the appropriate side of their Faction Sheets. Each player draws 2 Mission cards and adds them to the 4 starting Mission cards to create their starting hands. Place Rebel Loyalty Markers in the 3 Rebel systems as shown above. Place 3 Imperial Loyalty Makers and 2 Imperial Subjugation Markers as shown above. The 5 Imperial Probe cards are returned to the box. Return the 3 Rebel Probe cards to the Probe card deck. Shuffle the Probe deck and place it on the board. Imperial player places his initial units (see table above). Units can be placed in any Imperial systems. A minimum of 1 ground unit per system (including Coruscant) is required. Rebel player places his initial units (see table above). Units must be located in the Rebel Base space and/or any 1 Rebel or Neutral system. Rebel player takes the Probe deck and chooses any system to contain the Rebel Base. Set the chosen Probe card face down by the Rebel Base space. Shuffle remaining Probe cards and set deck on board. Start the first Assignment Phase of the game!